I find it a little disheartening that it’s far too easy to buy apples 365 days a year. What we end up eating is a tasteless piece of fruit with mealy texture and reduced nutritional value 7-8 months out of the year. Look, I looove apples. But, I really love apples when they actually taste like a good apple should. That is why I am in favor of going hog-wild on apples when they are in season, to the point where you just can’t stand to look at them anymore, because by that point, they will be out of season again. Then when they are ripe from the tree the next year, you will be so happy you had the “It’s not you, it’s me” break-up talk with your favorite variety of apples. Sure you can sneak in an apple or two here or there throughout the spring and summer, but the more you hold off, the more you will crave them when they are actually edible and delicious. This is precisely why I am posting back-to-back apple recipes. One sweet, like the Bourbon Apple Tart with Brown Sugar Crumble, and one savory, like the Apple and Chicken Dumpling Soup you are diving into right now! Chicken-n-dumplings, although hearty and satisfying, is one of those Southern dishes that could use a nutritional boost every once in a while. I’m not knocking the tender chicken, lighter-than-air dumplings, and creamy gravy that I’ve grown up with. 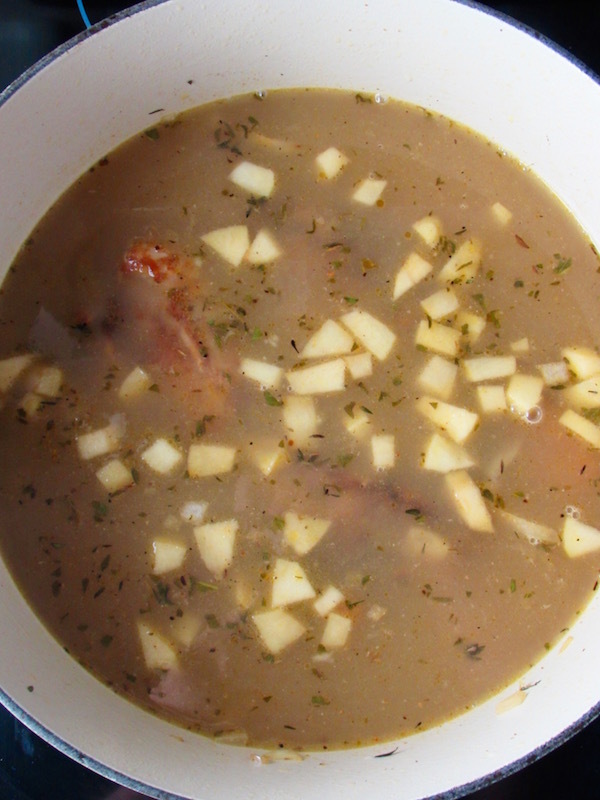 I just enjoy my dumplings with butter instead of traditional lard, and the added texture of apples, onions, and carrots swimming in a light and flavorful broth instead of gravy. This soup comes together seamlessly and only requires a cutting board, knife, vegetable peeler, and a large dutch oven or stock pan. While your chicken is browning, cut up your vegetables. When the broth is added, make the dumplings. While the dumplings are simmering, shred the chicken. Dinner is done!! 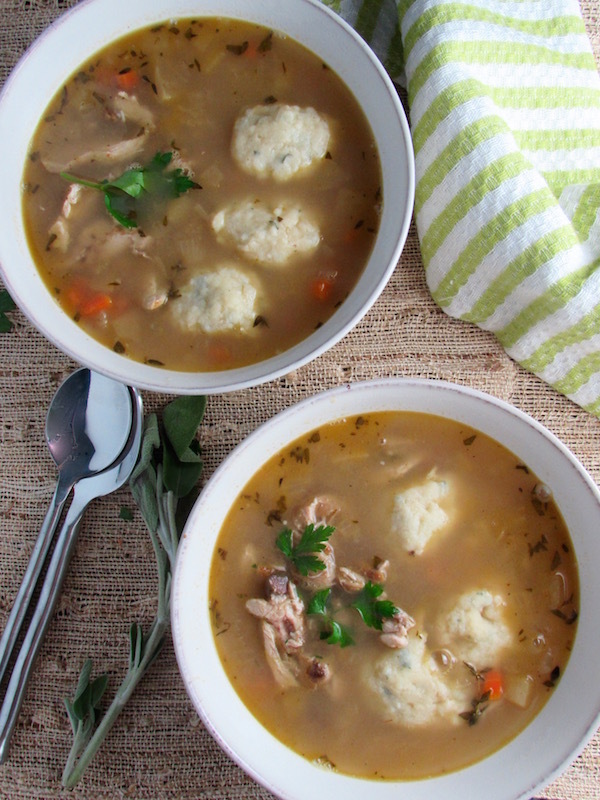 Crisp apples, carrots, and onions lay the foundation for a light and flavorful soup with buttery dumplings and tender chicken. 6 cups chicken broth 48 oz. 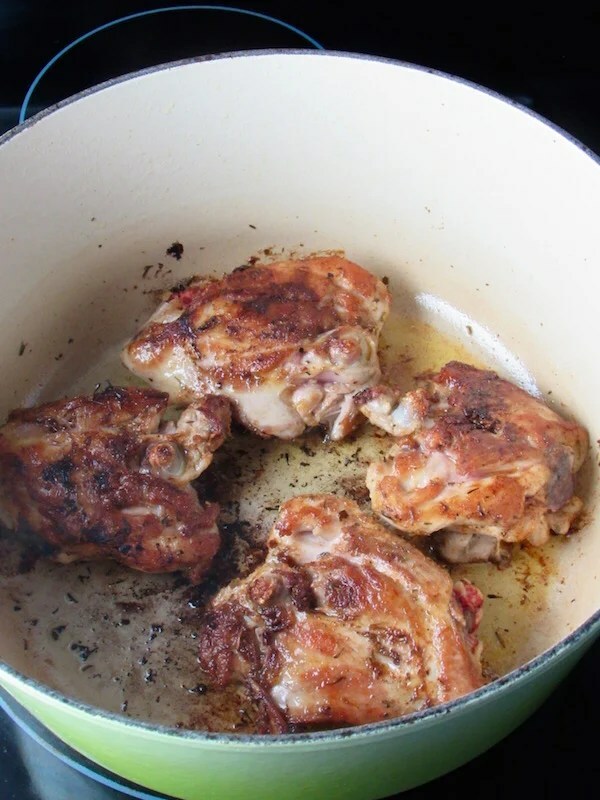 Heat a dutch oven or large stock pan over medium high heat with olive oil. Season the chicken with salt and pepper. Add chicken to the pan and brown both sides, about 5 minutes on each side. While the chicken is browning, peel and chop the apples, onion, and carrots to equal size portions. When the chicken has browned on each side, remove from the pan and set aside. 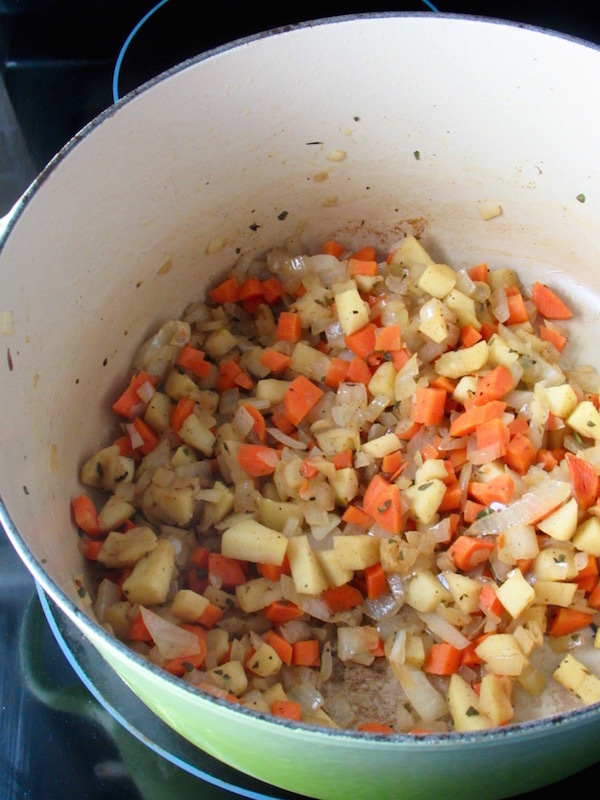 Turn down the heat to medium and add the apples, onion, carrots, sage, and thyme. Saute until softened, about 4-5 minutes. Season with salt and pepper. Add the apple cider vinegar and deglaze until all the liquid has dissolved. Scrape up the brown bits in the pan while liquid is reducing. Add the chicken back to the pan with the chicken stock and bring to a simmer. Turn the heat to low and cover the pan. Simmer for about 10 minutes or until the chicken is cooked through. While the soup is simmering, make the dumplings. Heat the milk and butter in a medium saucepan over medium heat. 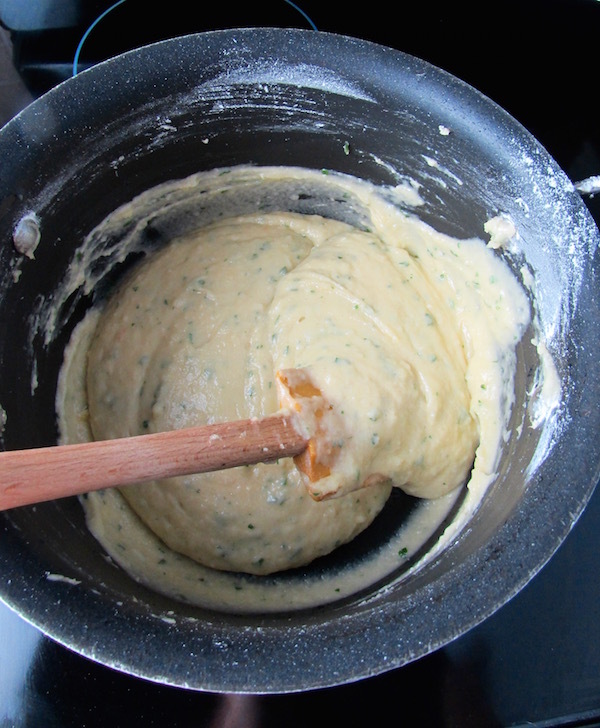 Mix the flour, parsley, and salt in a separate bowl. Once the butter has melted and the liquid has just come to a simmer, remove from the heat. Add the nutmeg, then the dry ingredients to the pan and stir to combine. Add the eggs one at a time and stir vigorously to combine. 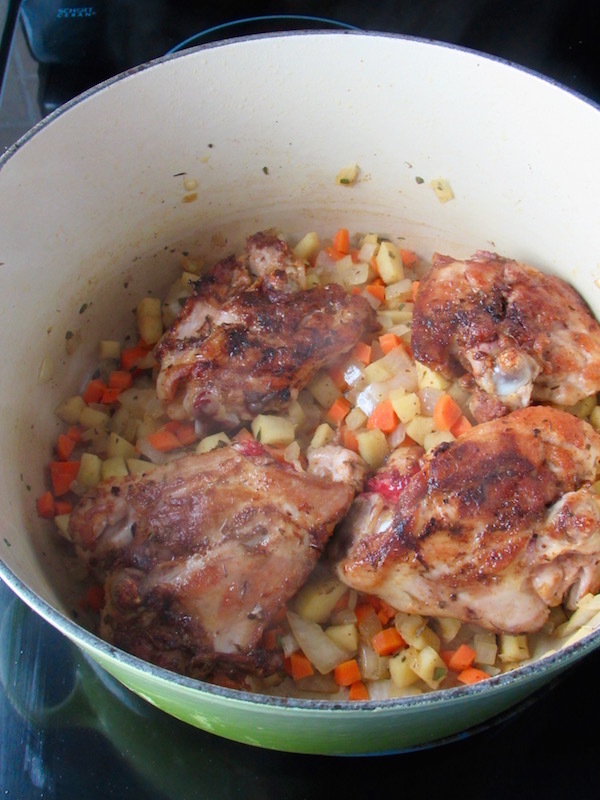 Remove the cover from the dutch oven and take the chicken out and set aside. Season the soup with salt and pepper to taste. 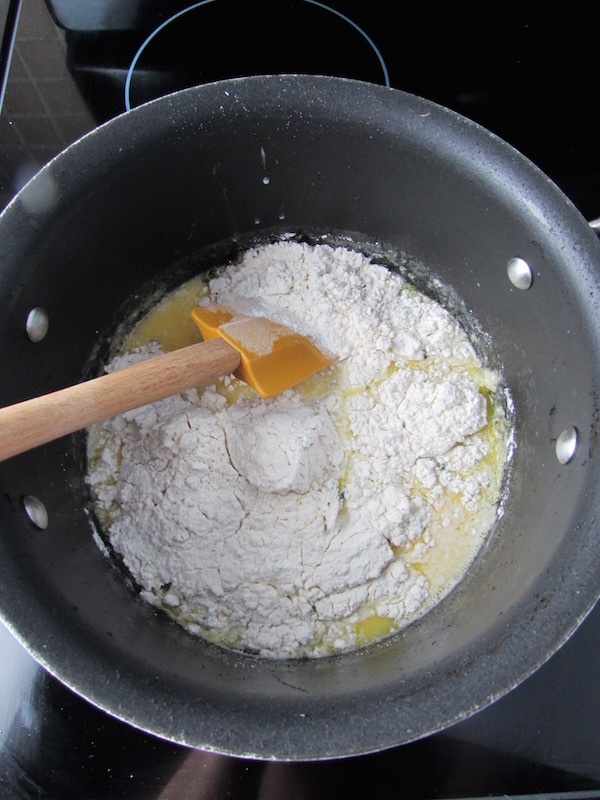 With a spoon, scoop up about one tablespoon of batter at a time and drop it into the soup. Fill the pot with the rest of the dumplings. While the dumplings are simmering, shred the chicken. When the dumplings have risen to the surface, they should be done. Taste a dumpling for doneness. They should taste smooth and buttery with no raw flour taste. Add the chicken back to the pan and serve!